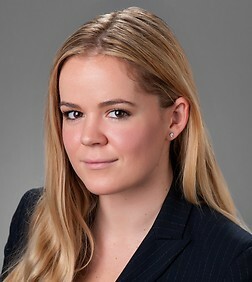 Bridget Russell is an associate in the Business Trial Practice Group in the firm's Century City office. Ms. Russell represents a broad range of clients in all types of commercial and business litigation. She has represented individuals, production companies, studios, insurers, physicians groups, manufacturers, retailers, and telecommunications companies. Her practice entails matters in state and federal court, including business disputes, class action defense, securities litigation, shareholder derivative cases, entertainment litigation, copyright, trademark, right of publicity, unfair business practice, fraud and trust and estates litigation. Ms. Russell is experienced in all aspects of California and federal civil procedure, including discovery, motion practice, arguing motions in court, and preparing for trial and alternative dispute resolution proceedings. Ms. Russell is a committed pro bono attorney. She regularly represents parents in adoption proceedings through Public Counsel and volunteers at the Los Angeles Veterans Affairs offering a broad range of legal advice to veterans. Diodes. Inc. in a securities litigation class action: won motion to dismiss first amended complaint and successfully defended that judgment at the Fifth Circuit Court of Appeals. A pharmaceutical company in a securities litigation class action. A number of retailers and brands in class action lawsuits in courts across the country alleging false advertising relating to their pricing practices. Several companies in different lawsuits brought pursuant to Lanham Act and Civil Code Section 3344 claims alleging misappropriation and false advertising. Sansum Clinic in an affiliation agreement and through the resulting Federal Trade Commission and California Attorney General investigation. Several companies in different lawsuits brought pursuant to the Copyright Act alleging infringement. A manufacturer in a shareholder derivative action alleging breach of fiduciary duty on the part of the Board of Directors as a result of their approval of stock option grants. Trustees, individually and as fiduciaries, in several trust contests related to alleged breaches of fiduciary duty, fraud and mismanagement of the trust.